Taking time out of work for health is more fun than taking time for the doctor. Exercise is such a crucial factor in efficiency and health that large companies who look at their bottom line really DO take notice…. Small companies just don’t have the time. Also the problem with exercise is that being busy reduces the desire to exercise – it’s all too easy to skip the walk and take a bus to ‘save time’. Talking to colleagues makes them friends. By a lovely pool in town I find time. Most problems can be sorted out with good communication. Clearly this has to be the intention rather than a good old vent – however communication is the very best way to clear up a mess of mistakes or misinterpretations. Originally created for the exclusive use of Waldorf guests, this pool setting, sauna and steam room is a place where leisure is built in. it’s a great way to find the time to communicate. I like to have time on my own thinking. I find the presence of water peaceful and swimming certainly clears my head. I am a busy and the more people I had working around me the less time there was to go for a swim. (I thought it was going to be the other way around! Also, finding time to just chat to get to know my colleagues was hard. One day I took the plunge and asked a colleague, I really needed a meeting with, to accompany me to the gym. She looked amazed and agreed and we made a date the following day to go for a swim and sauna at the Waldorf Hilton on the Aldwych. Thinking and baths have an ancient connection. Plans are made in steam rooms as well as on the golf course. It is well known that Archimedes was bathing prior to shouting ‘Eureka’ at his famous discovery. 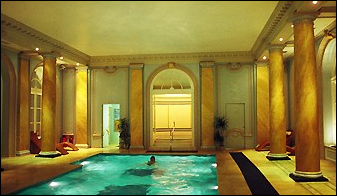 The reason I am picking out the Waldorf pool for guests is because you can combine a high class of luxury with many other good services provided by LA Fitness who have gyms and classes all over the world and many in London. It’s lively but not noisy so it’s peaceful – a place you would want to be – to find time in. The pool area is genteel hollywood, with pleasant colours and lights. A great place to think in is where the hosts take immaculate care of the environment. LA Fitness, having inherited the architectural detail like columns and fancy ceilings, take care of health detail right down to the high quality of the water in the pool. One might think that while swimming, doing a class of Pilates, taking a spin with lots of energetic cyclists, one would not be the place for thinking or strategic conversations. True enough – there’s not a lot of waffle being shouted between neighbouring treadmills. Speaking from experience there is a serious advantage to be had from going to the gym apart from feeling more comfortable afterwards. That’s clearing the mind. This advantage is only open to those who refrain from watching the television while exercising. I might expect opposition from boobtubers. But I don’t mind – I doubt if they will be reading this by default. Too busy being drip fed with audiovisual adverts, ‘news’,soaps, dramas – anything insignificant enough to take up all of their dormant attention. These folk are not going to shout ‘Eureka” any time soon. TV aside though, talking, thinking, increasing energy, circulating blood and oxygen to the brain – amongst other parts, raises the energy and that is good for conversation. It’s a fact – conversation is the best way to get to know people better than you know them already. The good results are so consistent that there are surely many scientific reasons for it – including the good old placebo. With this approach a person occupied in business can create more business. The initial struggle of finding time to go to the gym for a swim can be replaced by the satisfaction of finding time IN the sauna or steam room. Without the distraction of coffees and snacks or possessions to watch out for, the space is clear to think things through. A Finnish proverb advises people to behave in the sauna as they do in church. Bathers in Finland are warned against shouting, cursing or telling tales. Even being unaware of this, there is an air of ‘cleanliness being next to Godliness’ as spoken further West. Everything is easier when it’s helped along with a good habit. At first it feels like discipline then it starts to feel strange if you miss a session. A way to get into the habit of going for a swim or gym is to take a class so there is a specific start to the appointment. It is also very helpful to take up a challenge of learning Yoga, Pilates, kick boxing or an aqua class etc to form new habits. At LA Fitness, these are included with the membership. The body building or fitness machines have computer programmes that feed back where you have improved in strength and stamina – and the rest. All thoroughly modern. As for habit, it helps that they have gyms and pools all over town and other countries you may travel to – if the hotel has not got one. Only got 35 minutes? Don’t worry – you can do it. Does it take you ages to get undressed and dressed up? You should see the speed of the regulars. It’s like all the fitness and healthy thing – a matter of practice. Timing yourself and racing your time makes it far more fun. A sophisticated gym is now available for LA Fitness members with state of art training systems, classes & care. If you want to contact LA Fitness – call Lydon or Levi on 020 7379 5606 and make a time to start. The more you do the more energy you will find to do more. Fact.